Your syncing feature is terrible. Can’t ever share office docs with coworkers because nothing is ever updated correctly. Why am I not already using google drive? I phone and I pad issue. 9/14/2018 Any files set to view "offline" are lost after logging out. That is, when logging in later, the "Offline" button does NOT have the list of previous files set for offline viewing. It only shows how-to instruction to set files for offline viewing. Favorites are retained. Please fix. 7/17/2015 I’ve been using Box for several years for archival storage, which was it’s original focus. After updating today, I noticed that many subfolders are now empty! Very disconcerting. Add a setting that allows users to sync offline files manually rather than automatic syncing when opening the app while connected to Wi-Fi. Box has been known to have preview issues and this app is no different. I use box for large video hosting however when attempting to preview videos, they do not stream well if at all. Downloading this app was advised however it’s the same story. I can’t download any of my videos to my device nor can I preview/stream. How do they not have a developer working on this? I sold my Box stock because they’re just not going to be able to compete in this space.. The Box app used to be great. Nice, simple interface that made flipping through files easy. Now it's a mess, with slow, sometimes totally unresponsive controls and a stupid auto hiding toolbar that has exactly zero buttons that I would want there. Why did useless control panel get added instead of actually useful controls based on the filetype? You know, like most modern file managers and almost every other cloud storage app does? I don't need quick controls for sharing and adding to favorites, I certainly don't want them on a bar at the bottom that looks ridiculous and slows down the app while it tries to decide if it should hide itself or not. Complete dumpster fire of a UI. Store your files in Box, but good luck finding them. This app makes zero attempt at real search usefulness. The search filter options are very limited. If you want to search for a file with a specific extension, you can’t. If you want to search for a file with a specific alphanumeric string in the file name, you can’t (!?!). If you want to search for files with modification dates of greater than 1 year ago etc, you can’t. Most file browsers for cloud services are total garbage, and the Box app is no different. Not sure what happened, but you can’t view a PDF on the iPhone app anymore. Basically useless for me unless this gets fixed. IOS 11. Have recently been having trouble logging on and then getting a lot of upload errors. Have used this app for several years and have not had these issues before. About 75% of the time I try to log in or reach certain folders, it tells me internet appears to be offline. I know my phone is online cause I can reach the internet on every other app. I have uninstall or reinstall and at times that still does not work. It is horrible. I pay yearly for box. Have for years. When I use the desktop version now I get a pop up every time I select a new folder trying to up sell me on a $5 per month security feature. It annoys me so bad I will not be renewing my yearly accounts that expire at the end of the month. Thank you marketing team. You’ve managed to drive away an existing customer. Your annoying continual pop ups drive people away. Paying customers! Baffles the mind. How are you supposed to verify your account on a new device (when you upgrade your old device and get a new phone number)??? Ridiculous that there’s no other means of verification other than phone number, even after changing the password! Thank you for getting HD streaming to work again! App seems to function and respond much better. Great update. When uploading, let’s say, 30 photos to the cloud (which are like half a MB each) it can take up to half an hour do to strangely long pauses between each upload. Very inconvenient. Can’t seem to get any videos to go to my camera roll. All the basic functionality I need for my documents. The document conversion for preview is great. I rarely get logged out anymore so I gave you a star for that. I find offloading my photos on my 8S a breeze with Box—I use Box at work and have a private Box account. It’s easy to write on Word and share it to the cloud and, the mobile app is nimble! Keep up the great work! I upgraded to full version and I can’t login. Reset password. Restarted IPAD. What a rip off . 79.99 down the drain. Finding more and more apps on apple not working. DO NOT BUY UNLESS YOU HAVE MONEY TO WASTE. When I first downloaded it everything went smooth. 6 months ago it would no longer accept my password and no matter how many times I updated it, the app would not take my new password. I’ve been unable to get access to my files for 6 months. I also can’t get into the website because it won’t accept my payment info and until that’s completed you will NOT have access to your files. It used to be that you could use voiceover to read the word document, automatically turning pages. The newest version of Box disable that. As that was the biggest feature that I used in the app, the app is now useless to me and I have to go to a computer to have the documents recited to me. I get eyestrain and I cannot read documents on the computer, and printing them out waste paper. So the new version is bad for the environment. I may just go to Google Drive or Dropbox and take all my writing groups with me. Ability to delete cache gone! Please note on latest update you CAN NO LONGER DELETE CACHE! If this matters to you do not download the current update! Man this app is getting worse. I loved box but now it’s super slow to load. After the last update I discovered that my most used, most important file no longer existed. Old files were still there and new “how-to” files appeared but I *need* that key file. Within the past 2 days, every time I try to open the app & access my files, the app constantly freezes & then crashes. Followed by me having to sign back into my account for it to rinse & repeat the process. I never had this problem before so can you guys please fix this? Terrible. Established account, verified, then wouldn't allow me in. Had to establish a new account. Different email because they said I had an account there with the first email. Same thing happened. No access and never received second email to verify as stated in the app! I cannot believe Apple recommended this app. It is horrible. You can't even register. NO STARS. I verified 2 emails sent— delete all of my information please! Sheesh they make you give a star. Fine. I give 1 star but there should be a space for ZERO. When I scroll down it freezes a lot. Even through the music I’ve made for offline listening. The whole UI feels very basic and outdated. Simple things like when you have a folder of photos being able to view thumbnails so you can know what you’re looking at without having to open each one individually, just don’t exist and that’s a pretty basic functionality by most standards when it comes to file organization and management. Great app! Only one problem. This is one of the best places to store pictures/videos/gifs. I would give it five stars, but it takes so long just to upload a single picture. Other than that. Awesome, awesome app! Using this as an online cloud archive for photos is worthless. Thumbnails often won't load and neither will the photos themselves. The backend of this service needs work. Version 4.3.1 logged me out, deleting all of my files and folders saved for offline access!! As an early adopter...thanks for the great app and customer service. I have had box for a few years now. They have always kept up to date in terms of interface. It is 100% the app I trust and use. I highly recommend. Add pdf editing for iPad? I overall enjoy the app (3.5/5) but it is severely lacking in its inability to edit PDFs on Box using iPad. The added step of having to export into iBooks then re-import into Box hinders the functionality that the app boasts. On my 9.7” iPad Pro, I am unable to download (open in) recently uploaded files. The Box app for iPad is largely fine. I like the ability to quickly open a file in Microsoft Word and then be directed back to the app when closing. 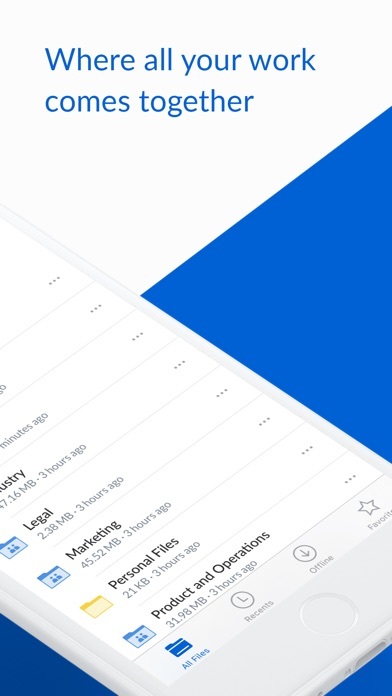 I would request however Drag and Drop support as it would make file management, especially when downloading files from email, more seamless and simpler to use. Yesterday I downloaded this app and tried to establish a new account. Three times they said they were sending a confirmation and it didn’t arrive. They suggest checking the spam folder - the messages weren’t there either. I thought perhaps they weren’t operating on a Sunday. Today I tried account. When trying to setup a new account, they indicated that there was already an account established. But, my password wasn’t accepted. I selected the link for trouble logging in and once again they indicated that they were sending a link to change my password. Once again two attempts, two promises - zero messages! There has to be a better app! Dropbox works so much better! I have needed to use this app for accessing files for my job several times. Each time I have tried to set up an account, it says I must verify my email by clicking a link they send to my address. That would be awesome but the email NEVER comes from Box! I have tried deleting the app & reinstalling. I have tried different email addresses for Registration. Nothing works! Except recently the AirPrint option has stopped appearing on my iPhone, so I need to pull up my laptop to print, or use a 3rd party app. 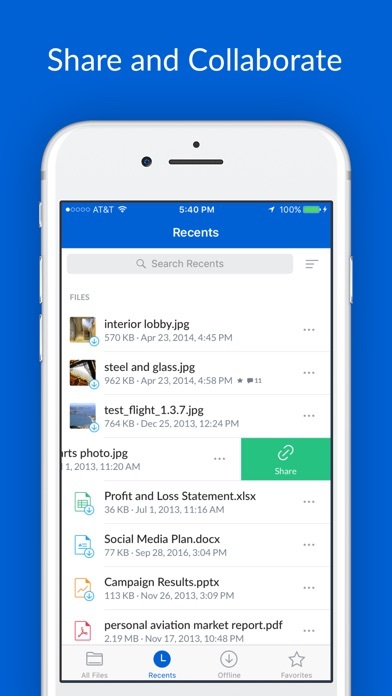 I loved this App until I lost over 100 files! Customer support has not yet resolved the issue. I’ve received no call back from them in the past 90 days. Frustrating to say the least ! I listen to recorded educational material with box. It needs a 15 sec rewind/fast forward option. If you miss a word or phrase, there’s really no good way of rewinding the recording just a little bit. You end up wasting time trying to scrub the recoding backwards and having it land on a random part. You are then forced to re-listen to large portions just to hear a small missed segment. The app logs me out multiple times a week. And whenever that happens, all of my downloaded “offline” files get dumped. Results in a very poor user experience. Box, please fix this! I mainly used this through windows.. Thanks for canceling support of window I'll be moving to Dropbox....bye. Wow! Way to knock one right outa the park! Latest updates hang the app and had to restart my iPhone X very often to get out of the app. Dropbox and others are now my preferred storage platform/app. Love it. Don't have any issues. The sync on Mac and Windows is slow. Lots of conflicting files created. Even paying them doesn’t bring faster or better sync. Why can’t box even keep up with Dropbox? Don’t recommend this service if you want reliability and someone who stands behind what they sell. Many videos don't play in the app. Many new files say "unable to load this picture" when trying to view them. Needs an update to fix these issues! Box is the backbone of everything I do with my devices. Box has been very reliable across all my devices. 5 stars for performance and reliability, 3 stars for price with 10GB. Google gives 15 for free. So 4 stars overall. After updating, the app crashed when trying to open any document. It forced me to re-login after each time and it still crashes. Basically useless right now. EDIT: Deleted and reinstalled. Working now but wish I didn't have to do this. Problems that are still here and aren't making this 5/5 -Zooming is still a little wonky (occasionally doesn't zoom in by doubletap) and you might need to troubleshoot by exiting image preview and reentering it. -Landscape swiping is still difficult and requires you to swipe halfway across the screen when it should be a small flick to view the next file. Please bring the web app tasking to mobile. Also, the @ mentions are quirky when pulling in names of people who have access to the content. Keep the updates coming. Love being able to have all my data with me at all times. Sometimes is kicks me back to the home screen when I try to view a file, sometimes it simply hangs. Either way it doesn't work. Before this version, no problem playing audio in the background. Now this cannot be done. Hey BOX ever hear of something called QA and testing? This app is not compatible with iPhone’s HEIC files. Months have gone by and according to the Community Managers on the forums the Product team does not have any immediate plans to making it compatible. Do not download. I can view high efficiency photos on iOS 10 on your competitor product. Not planning to upgrade any time soon. Simple to use across whatever device, secure, and continues to improve. Love recents functionality and comments for collaborating. Just plain bad. There are so many better options, just avoid these losers. This app is many months behind the Box for Android app. It needs to support multiple accounts pronto. Just started using this app on my iPad Pro and tried to open my first file - crashed and had to log back in. Then another - crashed - had to log back in. Then another - crashed and had to log back in. I can open some PDFs but Excel and Word docs have both crashed. Guess what type of docs we use the most? Very disappointed. Latest update crashes every time and will not stay open. Requires a new log in. Dec. 17, 2017. Whenever I go to a picture the app crashes and forces me to sign back in. App crashes sure. Sign in again? What is going on? Thanks for improving the performance! The app crashes often when syncing files for offline access. Also, add a feature that allows a user to manually initiate the syncing of files and folders for offline access. When the app syncs files for offline access, it uses internet bandwidth needed for the user to access and download files. All sorts of bugs in the Notes editor. Can’t undo, which can lead to data loss and is a terrible experience when multiple people are collaborating. It randomly jumps to different lines when I type with the cursor at the end of a line. The app just feels like it gets in the way more than letting me do work. Llevo años usando la app y es buena pero últimamente cuando subo las fotos me las cambia de fecha y por ende no están en orden. Y aveces se traba. De lo demás muy bien. Espero corrijan eso. Super exciting that box integrates with files on iPad. But as an enterprise user, my admin (rightfully) requires password to access box. This renders files useless. Please fix! Apple reimagined the iPad. You should reimagine this app. After Tuesdays iPad announcement, I’ve been thinking more and more about why I stray towards a laptop instead of my iPad. Apps like Box are exactly why — simple things like I can’t select more than one file at once to AirDrop. When trying to transfer from Mac back into Box on iPad the transfer shows as In Progress but yet after an hour it still sits at 0% completed. 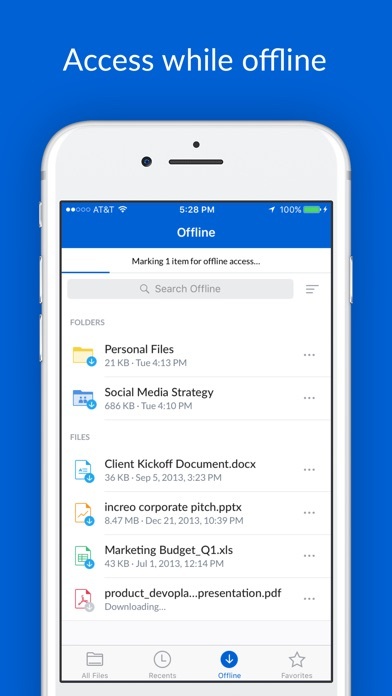 Apps are supposed to change the way we work (and at that hopefully for the better, more productive and easier) and yet this app makes me ponder why my company went with Box instead of OneDrive or Dropbox because this is not ready for prime time and its been out for some time, sadly. It asks me to log in every time and now I can’t even log in! It say the administration has blocked it or whatever and nobody knows why it does that. I can do sign up and then it leads me to the log in. So annoying. Off all the cloud services, Box seems to work the best. Great job! Currently completely unusable on the newest iPad. Non stop crashes and log outs. I particularly like the thumb nail feature. It helps me quickly scan through my files and locate what I need at the moment. Ever since the ios11 update you can no longer attach files from Box to your email! Total dealbreaker, until they fix this > uninstall. 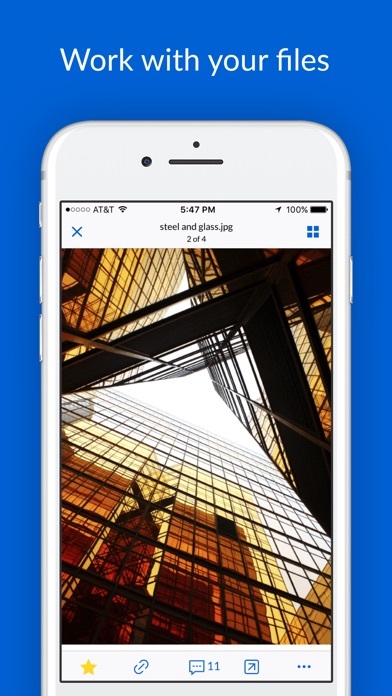 Been using for years but new iPhone photo format doesn’t convert to png when uploaded to box. Fix that and add ability to back up iPhone photos would make it a 5 Star app. Search for more than 1 file and it crashes then forced you to re-enter credentials. Since two weeks I am trying to update the app no way, do you know what going on? Thanks. First, App Support link in iOS App Store leads to Safari error about too many redirects. Wanted to report app issue but can't, of course. Second, app persistently presents New Notifications Available message when opening app notifications settings. Message instructs to update app in order to see New options. However, app is as up to date as iOS App Store allows. App and Box drive are OK. Have to use because of employer. Seems like the only person who can be tagged when using the Box app is the user who is logged in. No way to @-tag any others with access even if you know proper spelling of names. Frustrating until fixed. Many times I wait until I’m back at desktop or web to upload comments. ...unless you have it open in the Excel app. Otherwise I think this app is much better than OneDrive I also use for work. I would use Box for everything if they provided more space without a monthly fee. DO NOT USE! I have to use this app for my work and it always shuts down in the middle of my class and logs me out! The most frustrating thing ever. Also the new updates almost never load all the way the first time. Have to download it over and over again. I really expected better from Box. The app is laggy and buggy when playing music, watching videos, and viewing photos... I’m using iPhone 7 Plus with 80 gigs left, so it wouldn’t be my phone’s problem. Plus other apps run well. Hope y’all make the app better. Version 4.2.3 still asks me to log-in from time to time. Also, the app seems to hav difficulty successfully downloading and saving folders for offline access. The app shows up in the list of updates in the iOS 11 AppStore, but it just spins for many minutes, then stops. That has been going on for three days. Other apps have updated fine during that same period. The team at Box fixed the sign in issue, once again, a great app. This was a great app, but now since update it keeps logging my out, several times per day. Please fix and I will go back to 5 stars. I can’t save, favorite, or download a single file/folder about 90% of the time. I even deleted and re downloaded the app. My job uses this app to store some tech sheets. If I ever want to download a tech sheet I have to hunt down the link for it and then open it up in box. After that I have to open each individual file in Adobe. Beyond frustrating, and makes this whole app pointless. The app was essentially flawless until they decided to redesign the app. Now, there is nothing but problems and bugs with every single update. Think Microsoft changing their best OS of XP to the windows vista OS. Please return to previous bugles app. Notifications message is annoying since it says update but there is no update. It’s about as basic as it gets. A notification allowing the creator know if a note has been opened by someone with a link. iPhone X version is very buggy. Photos are not downloaded even I click on them. Most of the time only thumb nails of photos are shown and looks distorted. Dropbox and others don’t have these problems. Fix black font on the status bar on sharing (import/export) files screen. "Save to Box" shortcut would be so useful, don't stay behind! I notice that shortcut in Dropbox and pCloud. Surely, I prefer Box... just add that feature! App has always been solid, but the latest update seems to have caused a bug with respect to sending documents as attachments. After tapping the share as an attachment icon and opening my default email application, the attachment is not present. Any help in fixing this would be greatly appreciated. Fix black font on the status bar on sharing (import/export) files screen. Please bring the web app tasking to mobile. Also, the @ mentions are quirky when pulling in names of people who have access to the content. Add in support for multiple profiles with Touch ID support. I dislike having to log out constantly between work and personal accounts. Keep the updates coming. Love being able to have all my data with me at all times. Crashes constantly on iPhone X. On cellular, on wifi, at work, at home, this app will crash endlessly. Frustrating. Used to work, now it doesn’t. I have emailed them multiple times about this issue and they give me the runaround. I think I may switch back to Dropbox since they have improved things. Loving Box all the way around from the iPhone app to the desktop browser. I can stay up to date where I am. About half of my photos on Box that I click on show up blank with the error message ‘unable to load this picture’. Regardless of how long I keep it on my screen. Figure it out!!!! I want my pictures back!! I love it , works great for 4-H program. The app crashes upon starting the app, it can’t seem to handle opening and starting offline sync at the same time. ALL OF MY FILES ARE GONE!! This app used to work, but since last week all of my files are gone and I don’t know how or if I can even get them back! So upset because I trusted this app with wedding photos and important documents. Definitely don’t recommend. It runs the battery real fast if used for to long. So someone told me that and I tried it and it was true. Please explain. Hi Box App Team , ( Feedback) Audio & Video Playback - Reach features upgrade needed. 1. Play in lock screen 2. Variable speed with swipe gesture. 3. Custom swipe gestures for skip fwd or back. 4. Video pinch zoom , auto subtitles , 5. Video scrubbing preview ( like in YouTube ) For all computers , enable full cloud access without needing to store files locally but with option for offline access. Can’t upload more than one file at a time from iOS Pages to Box. You can selects as many as you like but it will only upload one. Box has terrible tech support. Save a tree: go Box! This app is fantastic: I have been able to eliminate printing out documents before hearings by loading the documents into the app. Aside from saving trees, I save my shoulders from not having to shlep around a briefcase full of heavy documents. Love it! Even after contacting Box two years ago then once more recently, they appear to refuse to allow audio files in a folder to be manually re-positioned for playback per the user’s discretion. BOX OFFERS NO OTHER OPTION BUT BY DATE. Even if you start a new folder and transfer individual files in the order you want them played back, this app STILL ORDERS THEM BY ORIGINAL DATE ONLY. A good app otherwise for general storage, but FORGET CUSTOMIZED AUDIO PLAYBACK LISTS for now. Must be too much like “rocket science” for Box, I guess. 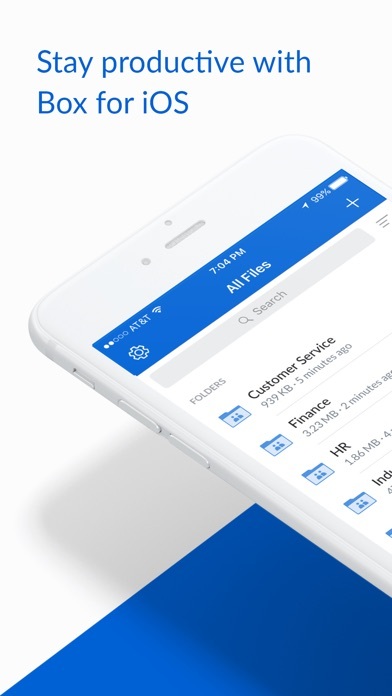 This is the best storage app! I can save PDFs, pictures, a little bit of everything! The app is otherwise great, and would receive a 5 star review if it weren’t for a fatal bug that their support said they were aware of, but they have no plans to repair. When writing in a box note, the bug causes the cursor to jump away from your present location frequently, rendering the app impossible to use for box notes. If you use box notes, the app is almost unusable because of this. Our enterprise does, so this is disappointing. We opened a case, and they said they were aware of the bug, but have no plans to fix it. Some bugs aren’t a priority, they said. Reassuring, right? I have love this app ever since I installed it. I love this application, best of the best. Easy to use, easy to understand. Easy to manage several construction project plans! I’ll update this review next month.